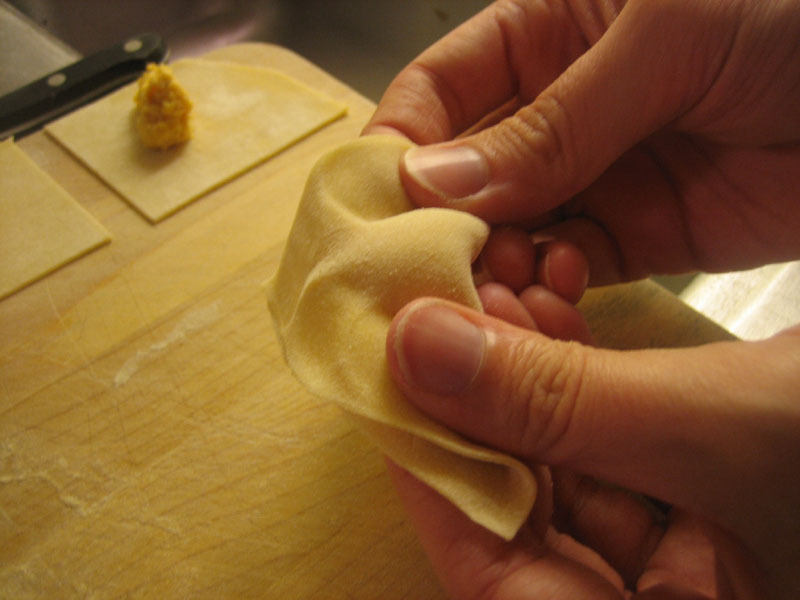 Most of us who are at least a little enamored with Italian food realize and recognize the vast and unending code for Italian pasta shapes. They range from fairly consistent (spaghetti is spaghetti just about anywhere you go) to the incredibly confusing (tortelloni can be either the little parmesean filled pastas we find dried in the grocery, more commonly known in the US as tortellini, or large, fresh pasta dumplings, or even a stuffed dumpling of any kind, as in a bit after the middle ages, when pasta was really making itself popular in Italy via Napoli’s maccheroni which we think of as being the elbow shape but in Italy can mean just about any unstuffed pasta shape, especially something similar to bucatini). Anyway, it’s not consistent. 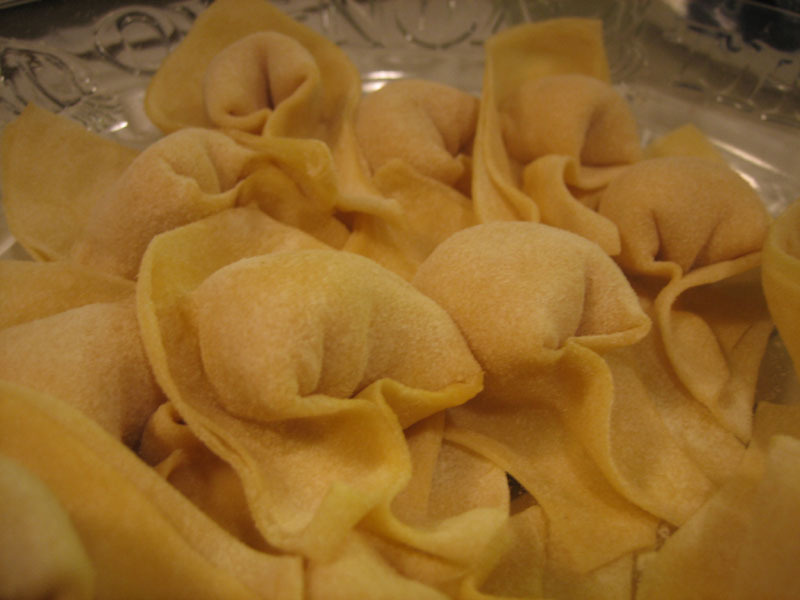 But by tortelloni here, I mean a stuffed pasta in a particular shape, as, well, shown. Blend all ingredients in a food processor until smooth. 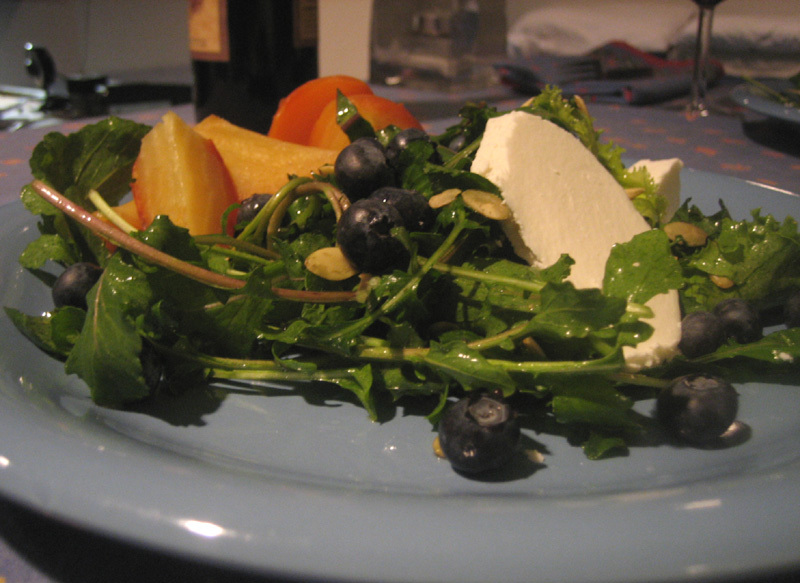 Add olive oil as needed to make a ricotta consistency. Mix the flours, pour in a pile and create a well. Sprinkle with salt, add the egg to the center, and gently beat to incorporate flour. Once somewhat together, use hands to mix the rest of the flour in until it takes a comfortable amount and is no longer sticky when handling repetedly for several rounds of kneading. Cover tightly in plastic wrap and let set for at least 1 hour, up to 12. 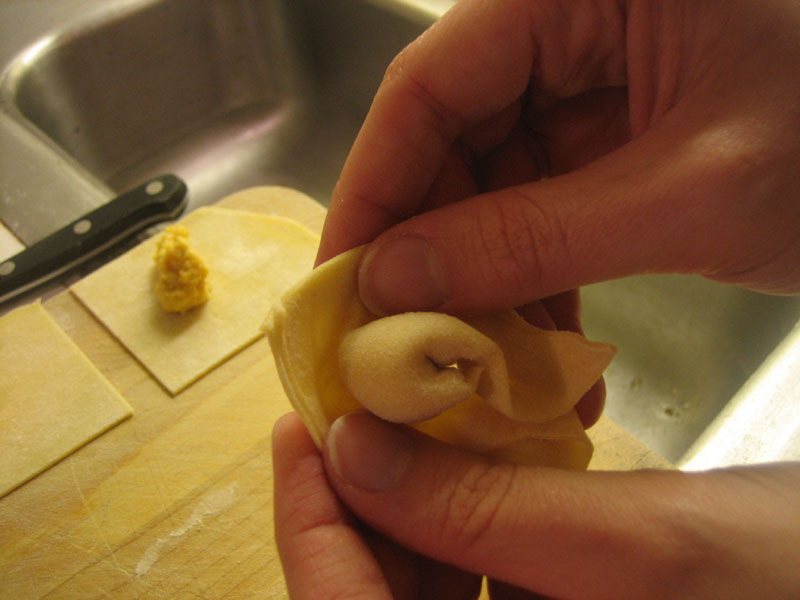 See this entry on making fresh pasta for more details on making the dough: How to Make Fresh Italian Egg Pasta. Roll the dough out using plenty of flour to keep it from sticking. I find it easier to work with half the dough at once, keeping the other half nicely covered with the plastic wrap. 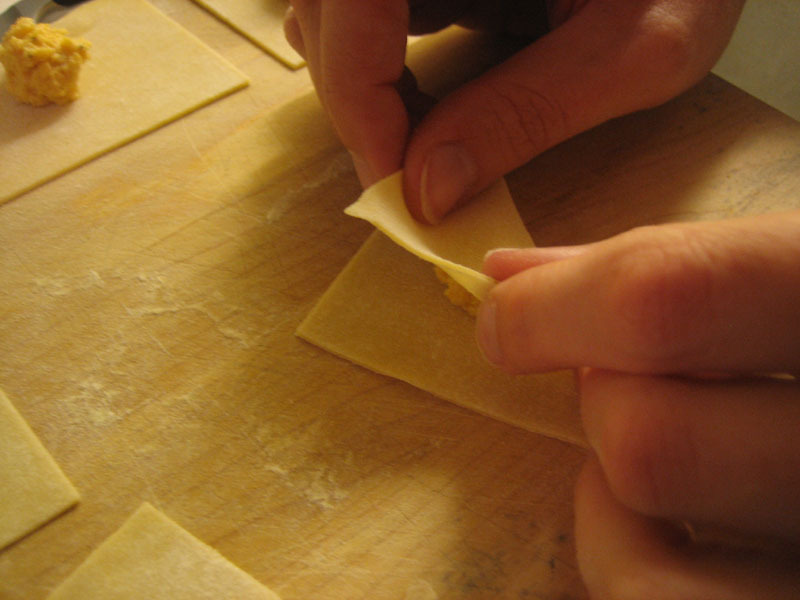 Roll out as thin as the dough will allow without tearing or becoming fragile. The longer you let it rest the easier it will be to accomplish this. Using the correct size flour (extra fine) will also aid in this. Cut in equal squares. I eyeball it, it doesn’t have to be perfect. 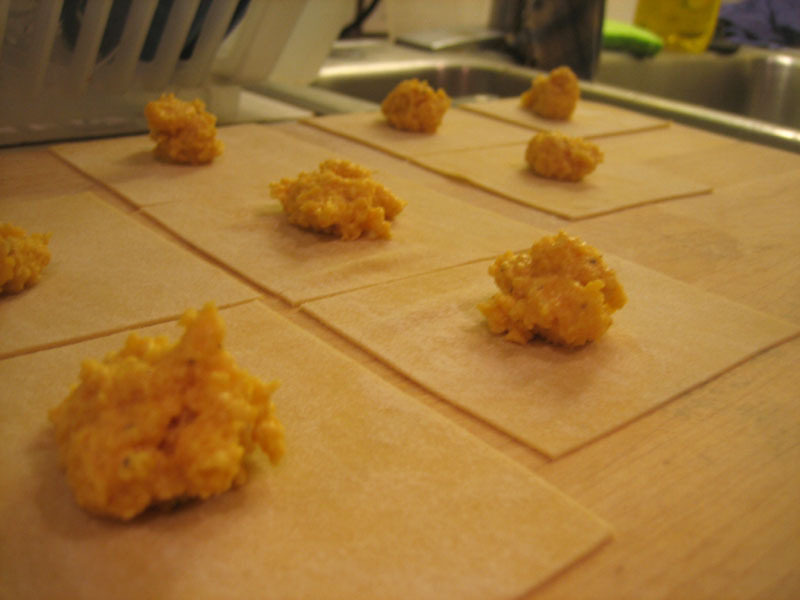 Add a small drop of filling to each square. Fold into a triangle and seal with your fingertips by pinching, starting at the top of the triangle and working around the edges. 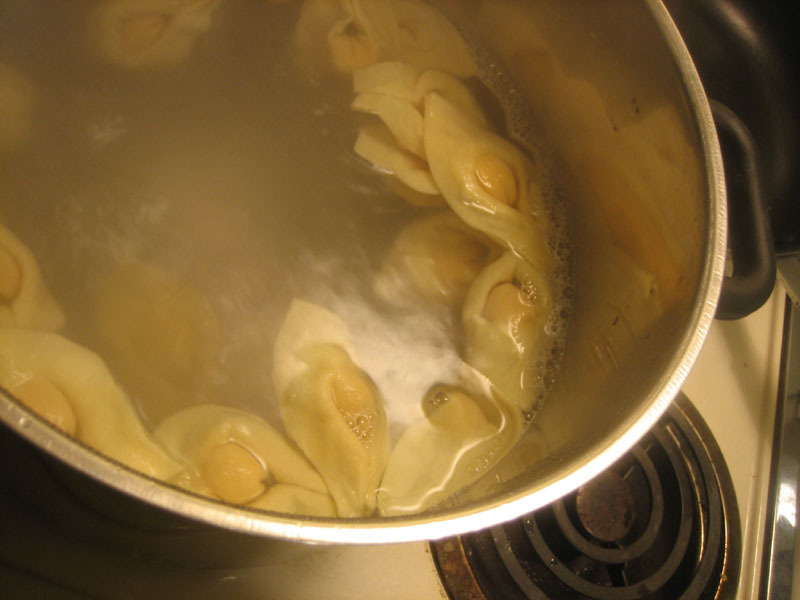 Try not to include extra air near the filling, or they may have trouble staying closed once in the hot water. Press the left and right sides of the triangle together to form a circle with a tail. 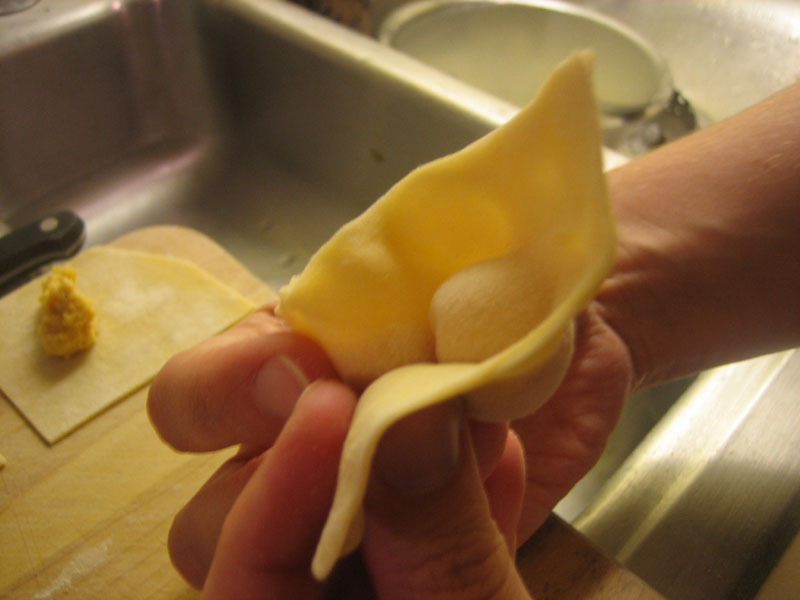 Flip the pasta “inside out” to create an edge that will help trap sauce. Cook in boiling hot water, salted (several T of sea or kosher salt). Meanwhile, melt 2-3 T of butter, adding salt & pepper; you can add poppy seeds too if you like. Let it brown, and add pasta as it’s finished cooking. Toss. Serve. Wine: this one is fairly tricky, because of the salty-sweet combo. A nice and soft, round merlot would work, as would a dry, less aromatic white. 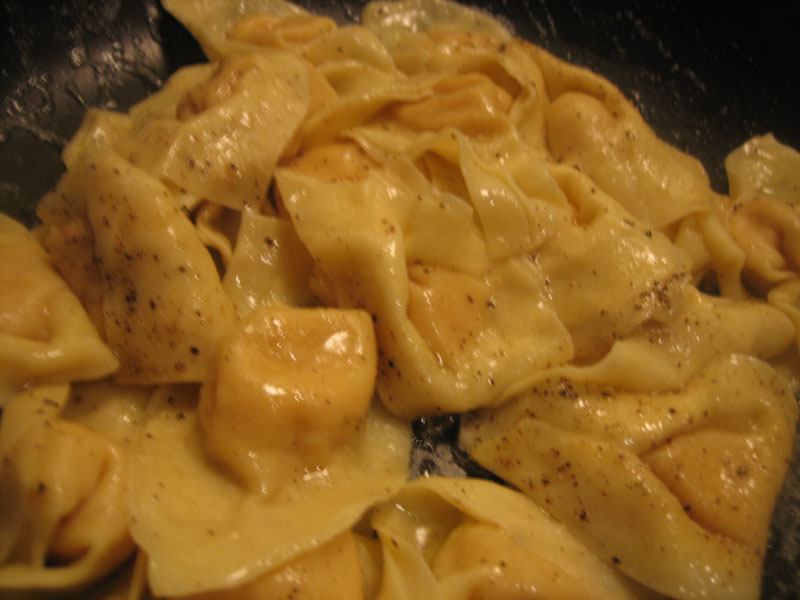 i have seen packed tortellini before and they r very expensive in the supermarket! 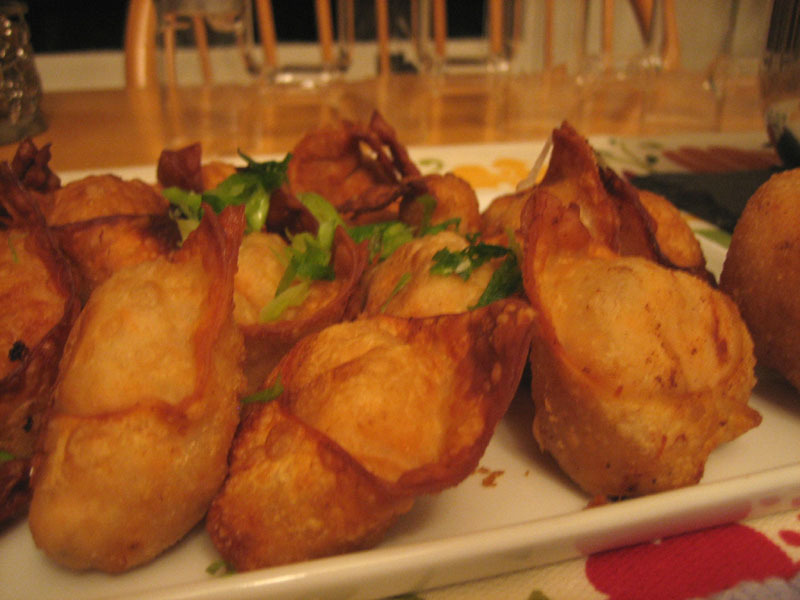 the chinese has its own version called the dumplings. have u tried before? Yum! I am going to try this tommorow! wow!! 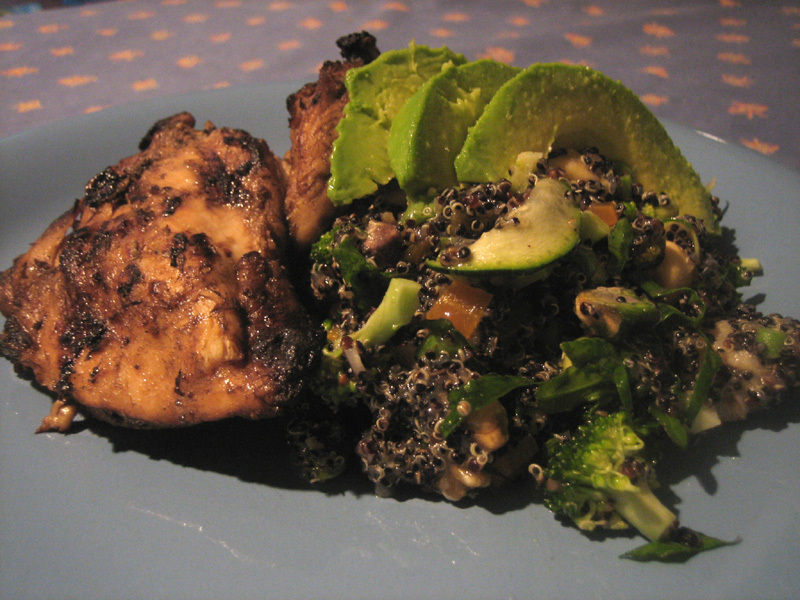 this looks interesting, Could not agreed more that , it is fun to be in the kitchen sometimes. thanks for the recipes.